A man’s body was discovered inside a burning vehicle that was left in a secluded area of Westminster Wednesday morning. Officers and firefighters responded to the 6000 block of Industry Way after receiving a report of a burning vehicle about 2:40 a.m., Westminster Police Department Cmdr. Cameron Knauerhaze said. 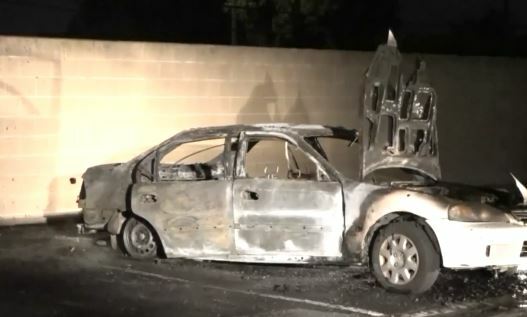 They found a white Honda fully engulfed in flames and firefighters extinguished the blaze. Officers then discovered there was a body in the back seat of the vehicle. The victim appeared to be an adult, but it was initially unclear if the person was male or female, Knauerhaze said. “The scene’s pretty grisly … It’s hard to tell much by looking at the body,” Knauerhaze said. Officials later identified the victim as male. Investigators were looking into reports that the vehicle had been stolen, but it was still unconfirmed, Knauerhaze said. The death appeared to be suspicious because of the location of the body in the back seat and because the car was found in a secluded area behind a business complex. “We want to treat it as a homicide until we determine otherwise,” Knauerhaze said. “We also want to investigate if this was a suicide … We just don’t know yet,” he said. Investigators will be checking nearby businesses in hopes of finding some surveillance video. Anyone with information was asked to contact the Westminster Police Department.